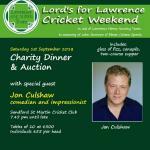 I would like to receive occasional information and updates from Lord's for Lawrence Cricket Weekend Charity Dinner and Auction - Saturday 1st September 2018 and jumblebee. 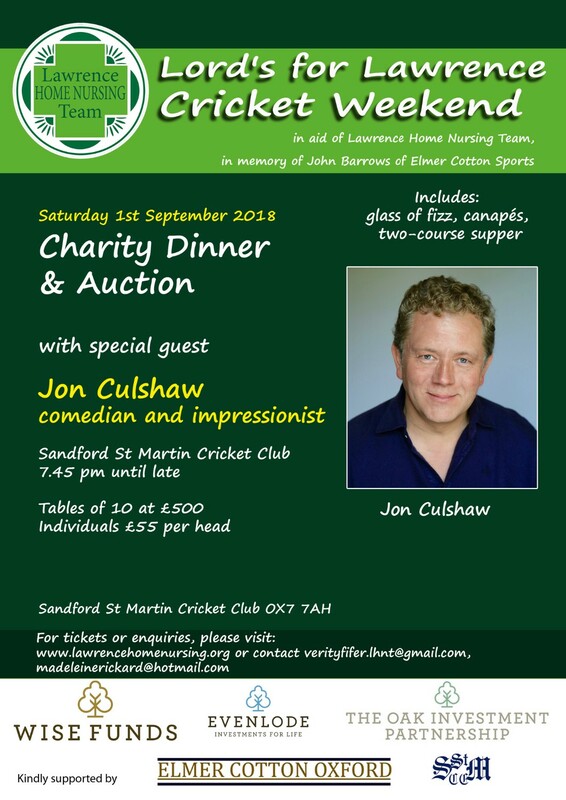 A charity dinner and auction in aid of the Lawrence Home Nursing Team and in memory of John Barrows of Elmer Cotton Sports, Oxford. at Sandford St Martin Cricket Club from 7.45 pm until late. Special guest auctioneer, Jasper Blakeley, aka Binkie de Sluice. Tables of 10 at £500 includes glass of fizz and canapes on arrival followed by a two-course supper. Individual tickets at £55 per head. A week's holiday for up to 8 people in May, September or October 2019 (subject to availability) in a spacious, private and rurally located villa on the outskirts of Gata de Gorgos, on the east coast of Spain. 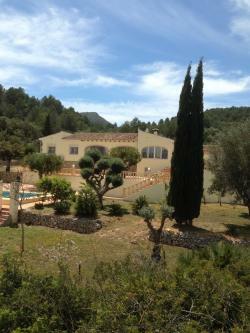 4 bedroom, 3 bathrooms, rural & private with mountain views and private annexe. The house is secure with remote-control electric front gates and security lighting. Cleaning is included; a damage deposit will be requested upon booking and refunded at the end of the week's booking. Anuk Naumann is an artist who lives and works in the Cotswolds. The subjects she paints range from the local landscape, the vibrant colours of the South of France, coastal scenes and still life. She works in acrylics and collage to create a multi layered effect. 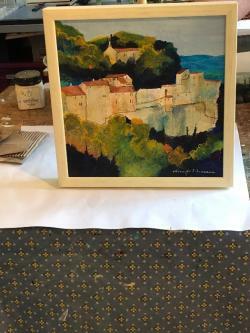 This painting of Gordes in Provence captures the vibrant colours of the South of France. Anuk works in acrylics and collage to create a multi layered effect. 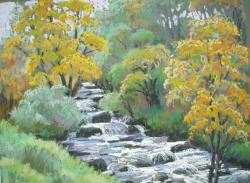 Pastel painting of a babbling brook in autumn by local artist, Andrea Bates. Andrea's work, in both oils and pastels, is much sought-after. Andrea has painted scenes in the Mediterranean and Canada, but most of her work (and inspiration) comes from the English countryside around her home in the Oxfordshire Cotswolds, and more recently, Scotland. The Plank or Skid Block is a mandatory attachment to the underside of a F1 car. 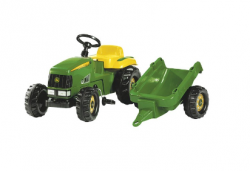 Usually made of a wood composite, designed to impose a minimum ground clearance and to limit the use of effects to enhance handling. This Formula 1 memorabilia lot is “the Plank” removed from Lewis Hamilton’s Mercedes F1 car following his first win of 2018 season at the Azerbaijan Grand Prix in Baku 3/05/18 . 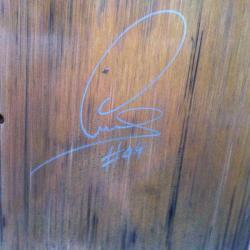 It has been signed by Lewis and comes with the provenance from Mercedes Chief Track Engineer Simon Cole. 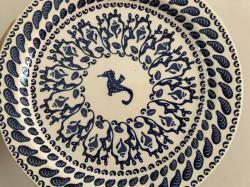 A large hand decorated serving platter. An hour's private lesson with professional tennis coach John Werner at Charlbury Tennis Club. A passionate home cook with a love for local produce who will cater a 3-course dinner for up to 6 people excluding any beverages or waitressing in your own home. I base myself on being a passionate home cook with a love for local produce. 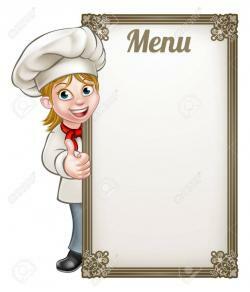 Sophie will cater within a 15 mile radius of her home (postcode OX77BS). Sophie will send out menus with a choice of up to 7 dishes per course prior to your dinner. 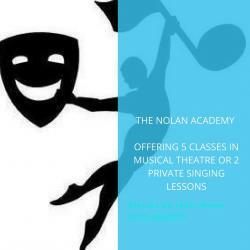 Jodie Nolan is offering 5 musical theatre classes or two private singing lessons in Chipping Norton. 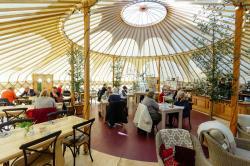 Treat you and your family or friends to a champagne breakfast at The Yurt at Nicholsons from Monday to Saturday. The Yurt is closed on Sundays. Come and take in the atmosphere at one of the most iconic club rugby stadia in the world. 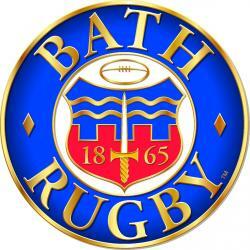 Surrounded by the Bath hills and against the backdrop of Bath's world famous Georgian architecture, take your seat at the Rec to watch the Blue, Black and Whites take on their fierce rivals Leicester Tigers. Fixture to be confirmed either Friday evening 28th December, Saturday, 29th or Sunday, 30th December in the covered West Stand.